[error ‘App’] [VpxdVmomi] Failed to start VMOMI services: An attempt was made to access a socket in a way forbidden by its access permissions. A bit of Googling landed me on VMware KB 2007152, entitled Starting the VMware VirtualCenter Server service fails with the error: Failed to create Secure WebService socket: class Vmacore::SystemException, which covers the issue – basically stating that something is hogging port 8085 (an important port used for SDK connections to vCenter) – and offers a method to discover the culprit. netstat -ano | find /N "8085"
For clarity, here’s an example from my lab as to what you should normally see: a list of TCP connections that are listening, established, or time_wait. The PID value, which is somewhat random, lets you know which process is involved with the TCP session. By enabling the PID column in the task manager, we can see that PID 3428 is owned by vpxd.exe (vCenter). Looking at the various process PIDs on the new vCenter Server, I matched the owner to a process called GravitixService.exe. Sounds kinda like a virus, but apparently not! A bit more Googling brought me to the Lumension site, specifically for their PatchLink acquisition which used the GravitixService process as an endpoint agent. Interesting enough, their Endpoint Management and Security Suite (LEMSS) was also running on the server for compliance and patching reasons. 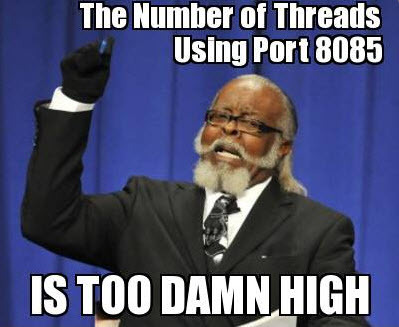 Hey, stop stealing port 8085! At this point, I had my smoking gun, although I literally could not find a darn thing on the web about LEMSS and the VMOMI service conflicting. Perhaps this is a niche case? Either way, if anyone hits this issue, here’s the workaround. Note: I ran into this issue using vCenter Server 5.0, 5.1, and 5.5 – I haven’t tested it with vCenter 4.x (but with 4.x support going away, I doubt it matters). Good read, had a similar experience with the Compellant console causing vCenter webservices to fail thanks to port conflict. Thanks Chris. We rebooted one of our vCenter servers for patching yesterday and it appears to have had the same issue. We use Lumension exclusively to patch all of our servers and have not had any issues. We upgraded to vCenter 5.5 about 2 weeks ago and had not rebooted it patches yet. Thanks for the blog post! I will be implementing your workaround shortly.